Shaving without all the needed accessories is equivalent to shooting blanks. There will be no concrete and pleasing results; however hard you try. To get to enjoy your shaving ritual you need a safety razor (or electric), a soft bristled shaving brush, sharper blades, an aftershave and a good scented shaving soap. Trying to sacrifice anyone of these assortments will lead to inadequate results. Wet shaving demands that you use the best shaving creams or soaps if you want the razor to be forgiving on your skin. Failure to do that will result in the double edge blade forcefully pulling on your beards like a car being towed away by town clerks personnel for failing to observe the set rules. The coarseness resulting from lack of sufficient moisture or lubrication will make your skin burn and develop rashes. This is why it’s essential that you don’t overlook buying a shaving cream or going for the low quality ones. If you are looking for the best shaving soap that can give you a distinctive feeling of classiness, try none other than Van Der Hagen Men’s Luxury Scented Soap. This soap is loaded with over 10% glycerin, coco butter, mango butter and Emollient Shea that gives it an appealing scent. While using a badger brush, this soap lathers up quickly to provide a froth medium that makes the blade glide easily on your skin. 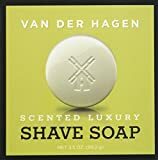 Among the many expensive shaving soaps and creams, Van Der Hagen Soap lathers up quickly and it’s easy to load on the brush. It also lasts longer to allow you make several passes before re-lathering. Besides its efficiency, you still need a good quality brush to get the best results. The presence of glycerin in Van Der Hagen Men’s Luxury Scented Soap makes it one of the few luxurious soaps. It can only be rivaled by Poraso and Sandalwood shaving cream. Glycerin makes this soap produce enough that lubricates the skin; a quality that makes it friendly to the dry skinned shavers. When it comes to longevity, this product falls a bit short because of its ability to lather quickly. The dense froth formed make the soap to be run through in a matter of months. This is actually not a deal breaker considering that the soap forms sufficient froth to cushion your skin against the blade. Additionally, it also comes at a very cheaper price so you don’t have to worry about its longevity. For those who give much weight on a soaps scent, I’d like to inform you that this soap has a lighter scent to it. So, if you are a fan of strong manly scents like Bay Rum or sandalwood, this product may not satisfy you. For me personally I don’t want the strong scent on my face because I have a specific after shave I use that takes care of that. So, I like the lighter scent but to each their own. Luxury shaving soap that weighs 3.5 oz. It’s one of the few luxurious soaps that come at a pocket friendly price. Presence of glycerin makes it one of the best lubricants for a dry skin. I really like this soap. You won’t find it has a really thick lather but it is just right to take your safety razor right through it. I like that it has a little scent to it as well. The soap puck last for several months as well. Van Der Hagen Men’s Luxury Scented Soap may have its downsides but in general, it’s a great product. It’s cheap, mildly scented and provides sufficient froth to provide a comfortable shave. Looking for more options? Hop over to our shaving soap section and see some more great offerings.